Applications of "Magic Eyes" also known as "Tuning indicators", "Magisches Auge" and "Cat's Eyes"
The original use was in 1930s to help people tune radio sets more accurately. Now when Magic Eyes are expensive and moving coil meters are cheap, it's hard to realise that in 1930s to 1960s the valve was far cheaper! The moving coil meter was too expensive. The Animation is of Y63 as mounted in a Greyshaw Instruments CR Bridge test meter when a leaky capacitor is connected of about 15 M Ohms. It really is mounted at right angles to the normal radio usage. Tuning Indicator on Domestic and Military radio receivers. Peak level or Null indicator on test equipment maybe even up to 1970. About the “Magic Eye” or "Cat's Eye"
The original types are the 6E5 family in 1934, Domestic radios from 1935. This includes the 6E5, 2E5, 6G5, 6T5, 6U5, 6AB5 and 6N5. All have similar characteristics and use the same 6-pin base, except the 2E5 has 2.5 volt heater. The 6E5 was introduced by RCA in 1935, The 6U5G is Octal version of 6 pin 6UG, very like a Y63, Some models were made not only in 6 pin and 8 pin versions but also in straight and bulb sided glass. Some "end view" Magic eyes had side contacts instead of pins. 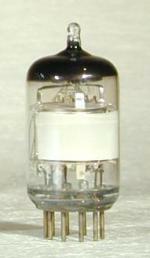 The "magic eye" has an amplifying triode, which is used to increase the sensitivity of the eye. The 6E5 uses a plain triode, while the 6G5 has a variable-mu triode to let it handle larger voltage swings. The 6AB5 and 6N5 were intended for battery radios, having lower filament consumption. The rare 6T5, introduced by Arcturus and Sylvania in 1937, has an annular ring shadow around its center, rather than the conventional angle shadow. Some models have a pentode. Often a "G" suffix means an octal version of a 6 pin type and a "T" suffice a Bulb sided version rather than straight tube. Thus a 6U5 is straight sides 6 pin and 6U5G is Octal and if a Bulb octal version exists (it would be like a Y63) it might be marked 6U5GT. But note that this is NOT a rule, the G and T suffixes can be for other reasons entirely. The 1629 was a common WWII 12.6V version of the 6E6 type. A similar round pattern is found in the types 6AD6, 6AF6 and 6AFG. They are not at all like the 6E5 types as they have two separate areas and no internal triode. They have TWO control grids, each controlling the opening angle of its own dark wedge independently of the other. This was useful for things such as FM radios where one side might show signal strength and the other would show multipath. Here is an article on the 6AF6G explaining how to use the independent patterns. Another still available “Magic Eye” is the 6AL7. Its display pattern was square, not round, divided into three rectangular bar-graph indicators. Two on top, side by side, with a double-wide third bar below. Being an "end view" type the bars are really quite small. The 6G-E12A is a Japanese “Magic Eye” . It has an octal base and its eye pattern is rectangular, with two open wedges which are controlled separately. Also Japanese is the 6ME10. It looks like a 6355. Noval/B9A side view "Magic Eyes. The Russian 6BR5, roughly equivalent to EM80, EM81 and similar to EM85 of 1953, one of earliest Noval side view "Magic Eyes"
The EM84 and EM87 (6HU6) are quite common. They have two bars that grow toward each other on an much longer panel that are brighter when they overlap. The brightest are probably the EM84, EM87, 6AF6 and 6AD6. Note that most of the miniature EMxxxs are side-view, while all the pre-1950s types are viewed from the end. The 6AD6/6AF6s give bright displays but require control-electrode voltages of more than 50 volts, as they do not have internal driver triodes. There is no apparent difference between a DM70 and DM71 except the DM71 has short pins for a socket and the DM70 is wire-ended. Any of the tubes can be looked up on the tube database and Members can see which models of Radio, Tape recorder or Test instrument used them. Note that tubes of same pattern and even same base may not be equivalent. 3a: Dual sensitivity, one shadow moves more. 3c: Dual sensitivity, dual control no amplifier. 16: Single shadow side view "angel wings"
17: Dual shadow side view "angel wings"
DM70, ( CV2980, 1M3), DM71, (1N3, 1M1, Y25). Sometimes called "Keyhole" Indicator. The DM70 or DM71 at full signal. Some of the EMM valves are very expensive due to demand for HiFi Stereo meters. The basic EM series though are affordable. For pre-1950s vintage sets it should be possible to use a cheaper alternative "Magic Eye" unless you wish to keep the Wireless completely original. The 6E-E4 Japanese Finger tube might be a magic eye type. Tubes that are NOT "Magic Eyes" but Neon (or Argon) Bargraphs or Tuning Indicators. Rare and poor operation Rod tuning(Tuneon) indicator. Tuneon 3184 by Cossor, similar 3180 & 4662, Flash-O-Graph, Tune-A-Lite, Tone-Beam. These are from 1931 till 1934/1935 when the first true "Magic Eye" 6E6 appeared. Aslo VFD such as DM160 or IV-15 are not Magic Eyes or Tuning Indicators but a different kind of Triode based annuciator. Also search for: Magisches Auge on eBay "worldwide"
Don't assume NOS (New Old Stock). Some are Ex-Equipment so may be dim as "Magic Eyes" wear quickly. Some may actually be new (possible of some Russian and Chinese, but could be 1990s NOS). Other models are available, NOS of DM70/DM71 and 6AL7 are reasonable price. Some others are very expensive, especially the later EMMxxx as well as rare old ones. It's a myth that Sunlight or UV destroys a "Magic Eye" in a few days. But they are less reliable than ordinary valves and the target "wears". Increased HT can help a lot to get some more life when it's dim. "Magic Eyes" can be quite well simulated with LEDs in a plug-in module powered from Heater supply if no replacement can be obtained. Either an LM3914 (simple types) or a PIC cpu (complex patterns and variations of brightness of shadow and overlap) can be used. This is based on an Article I originally wrote signed "Watty" for "Tectír" the Irish Technology Magazine site. This article was edited 19.Dec.11 22:34 by Michael Watterson . Available on ebay NOS from 1981 at reasonable price as I write.